Hello...First off, sorry this is SO LONG! I feel like a complete idiot for not understanding how to upload the course to my blog (a new blog, http://tracysztanya.blogspot.com) I don't even know if it's possible using Blogger. I have seen people talk about posting to Wordpress, but I have 2 blogs already using Blogger...one for my digital art and one when I was teaching Kindergarten. I feel very stupid because I have read, re-read, and read again -- https://community.articulate.com/series/articulate-storyline-2/articles/publishing-a-course-for-web -- and my brain seems to be missing a step at the end. I am self taught using Photoshop Elements and my Wacom tablet to create digital art, and I figured out how to upload art work on my own blog (http://yellowkittynotebook.blogspot.com) and other websites like Illustration Friday, but I cannot for the life of me make sense of how to finish the storyline course to put on my blog. I have "published" the course and saved it to my Mac for "web"(yeah, I even had to purchase Parallels to install Windows 10 for my Mac...so I am not totally ignorant on how to figure out some things!) ...it opens a window that says "successful". But now what? I apologize for not getting this; you probably wonder why I would even attempt instructional design if I cannot figure this probably simple task out :( If someone can explain step by step, not in the "publishing a course for the web" part that I've linked above, but VERY simple, please please help. BTW I've never used Dropbox before, so I am unfamiliar with any of that, and I don't have a website with my name which is why I've used Blogger for sharing info for several years. Thank you for helping this "newbie" out. I appreciate it! To upload courses on a blog, you need to own your domain (register and pay for the domain name and a pay for a hosting website). I may be wrong, but it looks like your blog is made from a free blog website, in which case, you cannot upload Storyline files. Thank you for taking time to answer me. Is this probably the only way then to begin to create a portfolio? If you need a place to host your Storyline courses you may want to look at Amazon S3. Amazon S3 offers free hosting with generous usage limits. If you go over your limit, you'll be charged a graduated fee. See this video tutorial by Tom Kuhlmann to learn more about Amazon S3. I have no "copy link" when I right click. WHY can't they just make Storyline 2 for MACS???? Do you have Dropbox installed on your Windows side as well as the Mac side? I'd keep them separate as sharing across the platforms could cause issues with the files themselves. 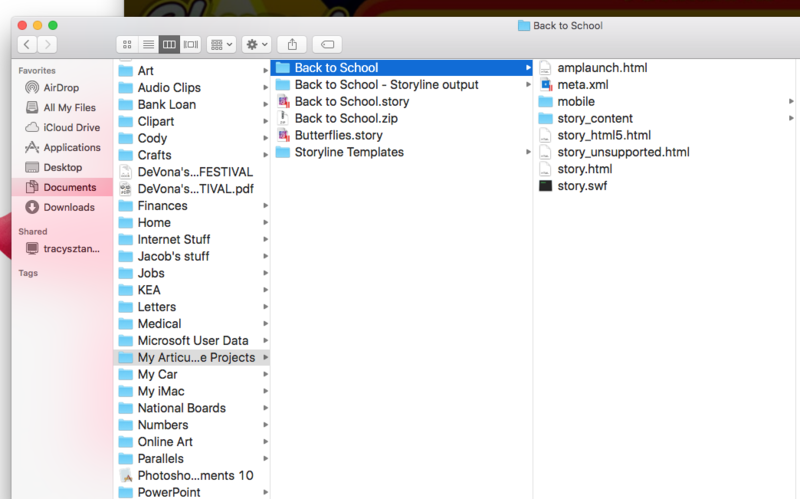 Within the folders you're showing, the "storyline output" folder is the folder prior to zipping - and often the file has to be zipped to be uploaded to a server or LMS. Regardless of the folder, once you've uploaded the folder, the file you're looking to link to is the story.html (second from the bottom in your last image). 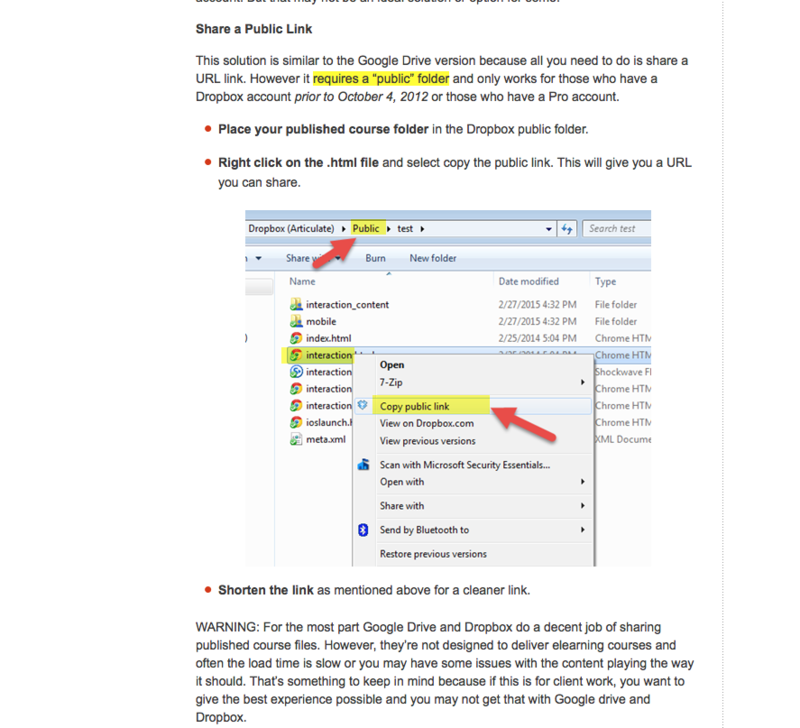 You also may want to try grabbing the link from the Dropbox website vs. your local install of Dropbox. Is your dropbox account a free account? If it is, you are not able to share a link to your storyline launch page and have it displayed like a website to the user. They disabled that feature for all free accounts about a year ago. * Edit: This applies to your public folder. 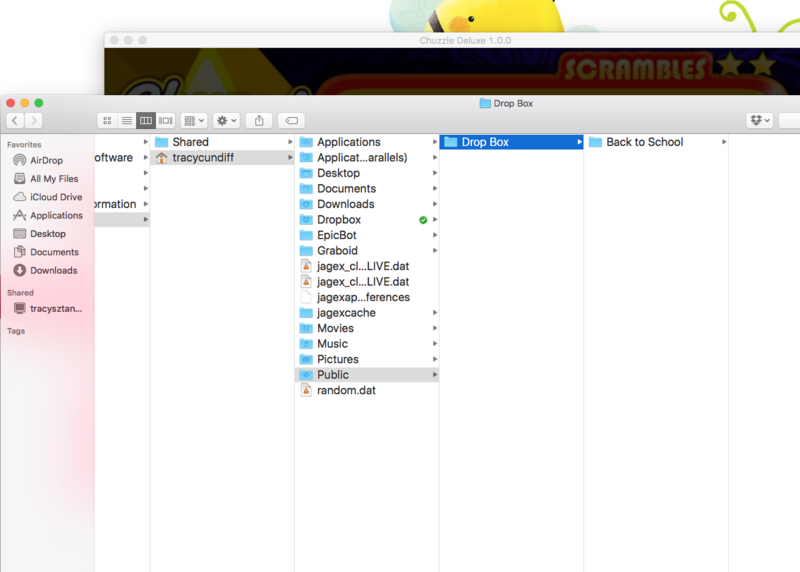 You can still share files and "files". "Hi Tracy, If you need a place to host your Storyline courses you m..."